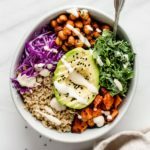 The best damn buddha bowl recipe there is. Preheat the oven to 425 degrees and line 2 baking pans with parchment paper. Pat your chickpeas with a paper towel until they’re mostly dry then toss them with the olive oil, salt, cinnamon, maple syrup and cayenne pepper. Place on a baking pan and bake for 30-35 minutes until golden brown and crispy. To prepare the dressing, blend everything together until smooth. Mix it up! Add any veggies you have on hand to use up your leftovers Prep these bowls into Tupperware for a perfect healthy lunch on the go!